Coverage, there is no comparison between sprays and oils versus Electromagnetic Corrosion Control (ECC). Not only are you protecting just the bottom of your vehicle, any missed areas are still vulnerable to corrosion. ECC protects all metal surfaces on your vehicle, top to bottom including the places oils/ or sprays miss. It is an environmentally friendly REPLACEMENT for oiling or spray undercoating. There is a 100% guarantee there will be NO MESS, ever, on any driveway caused by ECC. The standard 10-year warranty is longer than any spray will offer to protect your car. No sticky residue or overspray anywhere, keeping your car and your clothes cleaner! Never loses its effectiveness. ECC never wears out, never stops protecting, and the protection never degrades with time. The Module will offer the same protection 10 years after installation, as it did when it was new. The smell of sprays burning off the hot exhaust or drivetrain components is unmistakable. ECC is totally seamless, and scentless in its operation. You will never know it’s there. No flammable components. Unlike spraying flammable oil or some petroleum based sprays near hot exhaust components or fuel tanks, there are no fire hazards, or static shock hazards associated with ECC. Due to the Pulse Wave being ultra high radio frequency, there are no dangers when refuelling either. 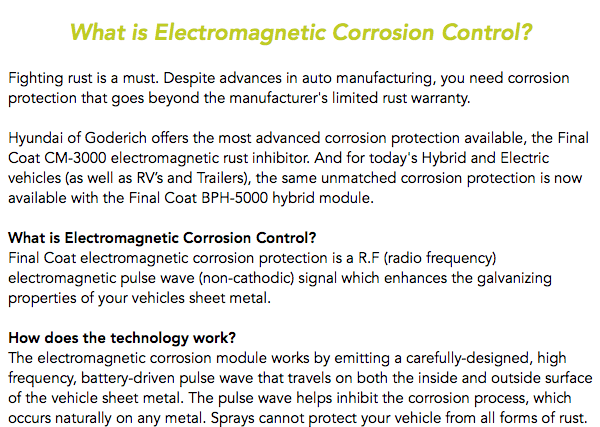 Electromagnetic Corrosion Protection is the safest, most cost effective, guaranteed method of protecting your vehicle against corrosion. Corrosion Protection works best when paired with Exterior Paint Protection. To get the most out of the fresh, new appearance of your vehicle, Hyundai of Goderich offers protection packages that extend the coverage of your 10 year No Corrosion warranty.